The interactIVe mission was to develop safety systems that support the driver, intervene when dangerous situations occur and help to mitigate the impact of collisions in accidents that cannot be avoided. The sensor platform recognises the driving situation, and issues information, warning and intervention (IWI) strategies that are based on driver's needs. 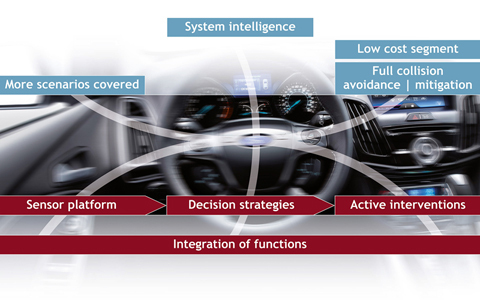 The number of driving scenarios covered by the project have been enhanced compared to earlier research: the combination of lateral and longitudinal active interventions by braking and steering offers new possibilities not only for mitigating collision effects, but also for actively avoiding accidents in a wide range of situations. The system aims to cover more than rear-end collisions, as addressed by current warning and mitigation systems. interactIVe has also tackled lateral and head-on collision situations. The scientific work in interactIVe will increase the system intelligence for avoiding full collision and mitigating collisions while keeping system costs at a reasonable level.